﻿ Okeelanta Corporation - Deeds, Abstracts, etc. Okeelanta Corporation - Deeds, Abstracts, etc. Folder: Okeelanta Corporation - Deeds, Abstracts, etc. and acting for the chairman who is out of the city. County Engineer for Dade County, Florida. Attorney for Board of County Commissioners. City of Miami Department of Water and Sewers. Health Commissioner for Dade County. large property owner in Northwest Dade County. University of Miami professor. .,. Soil Scientist, U. S, Department of Agriculture. of Florida Wild Life Federation. WHEREAS, the BOARD OF COUNTY COMMISSIONERS OF DADE .,. or its legal rights and interests in the premises. authority of the EVERGLADES DRAINAGE DISTRICT. Palm Beach, and State of Florida, this 8th day of July, 1946.
permit to construct lock and dam in Miami River at IW. 20th Street, Miami. from year to year seasonally. of the dams and became strongly salty. soil and water made unfit for agricultural, commercial, and domestic use. transition zone betweeithe two layers. in the last several years remained salty during the wet seasons. with uncontrolled canals extreme intrusion of salty water can occur. ;, f + ,. ,, : : '* \ -. ,. .
S .. .. 4 D.
-: 4, ,* ,*: **" ., ,e 4 v .- .. .
wa te .i t is. d e sira .b. 'le .tuo t; ... ,. 4. ":e '--. *s.* e .r :le "a s *-o",1. o e. .s ". ;^* .' ,. ^ . *:. -. ,' ... .- : *' "'l. '5 ; ; A' .-4'., . 4 . "4 "4" .+ .. ~_4' '- '.I '4 '. .,' 4 '4 "
4. ... .4. ,.. .
July9,. 4 $ .. -' e B. -g. p4. ,, .,.. . * "
"' '." '. 4 .,4 ." '3 '. "4., 4 -'"
P.ag, ,. ,''" 4 .. .... Q"_ "
4.- ,. .44 74 .4. 13?-)I I I- I I .
Miami Beach, Coral Gables, and all of Dade County. "FUTURE GENERATIONS WILL RISE UP AND SPEAR OUR GRAVES...'." around until they do actually find us. ration of winter temperatures, to-mention only a few benefits. 'l. Jones, page 3 "
S, sauerkraut in a, barrel with its bottom full of holes. any way at ny time. from the approach thd; had prevailed up to that time, as Mr. Mark R.
dazzle, it assuredly has been steady, straightforward and substantial. the Board, was recently turned over to its Chief Engineer. we have waited so long, may be in the process of development. is still left to us. of purposes but above all else the protection of the land itself. S is true, of course, for local areas insofar as agriculture is concerned. Fairly and squarely on the recorded subsidence of these organic soils. Everglades where the organic mantle is directly underlain by lime rock. from the actual burning which it sustained as a result of those conditions. tion must be the watchword. of effort required for its attainment. or more, if not all, of the highly worth-while purposes listed above. supply is handled. :' "' "
.. W. ashington, D. C.
and using their influence to swing the decision their way. immediately by the decision, will look small after a few years have passed. distributed to the residents pf this whole area. the agriculture which was growing up about the little town. acres and the Government monies spent on it increased in proportion. Chapman Field; even devastated as it was by the storm of September last. equalled outside of the great gardens of Ceylon and Java. S September Hurricane of 1945.
through the introduction of the Para grass and other grasses and legumes. plants is to say the least mosbdisturbing. this tropical garden spot around Miami and that stretches along the coast. the water flow in the canals. .
they should be given a free hand..
that our residents came here to enjoy will be gone.
' ,. : -"I .,. : ; *''? < / : : / ,' ;- .... .'' ** :. ... ** '" ..
by-passed by the thousands wao want garden homes beyond the region of cold weather. The despoiling of Florida's finest forest scenery has gone very far already. of the University of Florida. area from March 26 to June 10, 1946.
to the leaching effect of the summer rains. portion of the area was usable. Tropical Experiment Station and myself. early date provided future saline intrusion is. prevented. was about three and a half to four feet below ground surface. rise in the water table in coastal area of from 4 to 5 feet. County Courthouse, Miami, Florida, on July 11, 1946. One of the most serious problems that the citizens of Miami and 4"
also drained the Coastal Ridge.., "
citrus crops has been increased many fold. Florida since the Fall of 1939.
begun about 1910 and finished about 1918). S were not then known.
. 7 r .-r_ ., -r-. 1 1. '" case the local supplies were doomed; in other words, a complete investigation. well field was dead, the money invested in it entirely gone. S(as along the Miami Canal to a point west of LeJeune Road). Canal adjacent to the present well field. displacing freshwater in our huge underground reservoir. which there is essentially no movement of water at all. that must be done: . Wvien conditions are favorable for it, to do so. ..... C ... .. --..- .i-.li.-.., ..
::, d': r in the Miami ',Canal near lW 36th Street Bridge has temporarily saved the"
relief from salt water encroachment. ground water on all sides. These lakes thus become local "arms of"the sea"
entirely the burning of dried out organic soils in the Everglades. the many factors bearing upon it. to drain off the fresh water. in checking the salting up of the well fields. well fields might prove to be great enough to lower the water . table, the draft on the well fields creates a cone of depression. opinion, the location of the lock at 36th Street is so close to"
""'. w ater barrier' must be moved further downstream.,. an indefinite period in the future. cost of the project. ..
..this structure in the navigable channel. In order to.provide . of the ,locks would be.controlled' by a''gate upstream and. S' downstream with a loc)c chamber between the gates. of the navigation channel.which is- set at 15 feet below high . water. The width of' the large lock .structure would be 40 feet "
320 feet. A studyopf the navigation moving in .the canal has:. longest tows which were brou thrtb ough these nater wiit out "
small boats, .less thO 60 fet';in length ad '18' feet in ith, . lock 1rill take all the small bot ffiO's at ordinary times, . ,. .. .'., .' -, ..j -. .--' .'. ,. . ., t is not.intended'at this time to submit the detail.s. and barges,through the structure with the least possible-delay. little lbss of.time and therefore very little ddlayto traffic. anid are believed to be quite conservative. feet in length 86 per month, a total of 308 per month. be taken through the large boat lock in groups. Side flood-gates with protection against back pressure. of the channel can be' impeded. S .f.s., the velocity will be less than 3 feet per second. SThis flow is greater than the greatest experienced flows. S. .. very great and far exceed the cost of the proposed project. be maintained and operated perpetually. of the lock below the junction of the two streams would be the . any locks, as against having to pass through two locks if the. r. .. r I I ..)..-. --i .
plans by the War. Department. District Engineer N.W. 27th Ave., Miami, Fla.
N.W. 27th Ave. considered and entered in the record. Office and Yards 2481 N.W. 32nd Ave.
dam in'the Miami River as outlined in your notice of June 11, 1946.
whether or not they would'interfere with.same. we will be glad to do, of course, .without jeopardizing our business. Col. A. B. Jones "
vent this salt water intrusion. .applied for by the County for this construction be granted. From the Dade County Engineer Department. 'The summary is intended"
subject of a control structure in the Miami Canal will be discussed. facts of our Nation's ground water supplies. ITo. 4, Florida Geological Survey, 1944. No. 4, 1945, pp. 235-262. 1ater Works Association Journal, Vo. 37, IIo. 6, 1945, pp. 526-542.
illustrations in Vol. 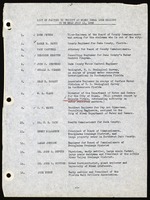 2, 1940.
discussion of the ground water, Florida Geological Survey Bull. each cooperating official has one copy. at a rate of approximately 235 feet per year. enough it stops or even moves seaward. above and on the sides. compared to the large amount available. above described, is almost entirely derived from local rainfall. annual contour on the water table exists. / Hialeah-Miami Springs area to the west of the dam along the Canal. the movement of salt water in the canal upstream from the dams. S... ..caused the cone of depression around the i.ell field to change location. tance-to travel tb gain access to the wells. stream than 36th St. preferably below the mouth of the Tamiami Canal. safe for years to come. .
: the north, and fifteen to eighteen tidles to the west (of downtomi Miami). Sthe Everglades more than fifteen to eighteen miles west of the coastline. PROPOSED MIAMI RIVER LOCKS . in Dade County which have previously been underlaid by freshwater. grant us the right to build the proposed structure. matter in more detail to you. DADE COUNTY COURT HOUSE, MIAMI, FLA.
Uew York 18, N. Y.
those within Dade County, for more than twenty-five years. the younger porous rocks above and the older porous rocks below. to permit the existing volume of fresh water flow to escape. maintained at the shore line of the Bay. substantially lower ground water.levels in extended droughts. and bottoms of the channels. from Perrine to Royal Palm State Park. north and south of the Hiiami Canal under the Bay shore ridge. blue arrows indicate the directions of converging flows. of sea water under it. natural water fall in the Miami River. The pure, good quality. water started at the time of the first World War and Mr. H. H.
only about 200 PPH as Cl. For a few years salt-free water was. ground water production area above the second locks near Hialeah. the source of water supply. water levels as recorded on February 29, 1944. (Exhibit 6). til balance of pressure is again established. S Springs Well field may be anticipated. (Exhibit 7). sections of the canals and obstructing flow of fresh water over'" ."
. ; : water withdrawal when heavy rains cause relatively high levels. at the locks in Iorth Hew River and South New River Canals in. water fbr various uses during periods of extended droughts. S was available under the area colored blue on the southerly east. bottom to hold their sea-water east walls at the shore line. reach of capillarity and roots of growing plants. future period of time if the present trend in growth continues. these natural ground water storage reservoirs. it should be in the immediate future. visualizing the operations of these coastal ground water reservoirs. table in farm lands so as to make such lands more suitable for farming. their oxidization and thereby preserve such peat soils. and numerous other agencies (local, state and Federal) have cooperated. tained in local areas from this program. has already reached very close to said cone of depression. : control becomes absolutely necessary if very great losses are to be avoided. ,that would require from 2 to 3 million dollars to satisfactorily replace. of fresh water in northwest Dade County. Ave. bridge and the junction of the Tamiami Canal with the Miami Canal. works do not enter into the request for this permit.
. to be built if that location were picked so as to complete the barrier. that the well fields will have positive protection. dollars for the moving of the water supply well fields and also will be':. would be made by boats Iless than 60 ft. in length and less than 18 ft.
second to .take care of the smaller boats. S320 ft. long with its sill approximately 15 ft. below mean low water. " S: is no necessity for a width greater than 40 f.t. and will have its si1l at approximately 7.5 ft. below mean low water. to the gates of the large lock. salt water at periods of low flow. the look chambers with fresh water taken from upstream by means of pumps. adjusting the water level in said lock chamber will be less than 2 minutes. It will therefore be seen that there will be very little obstruction to. these figures the time required by boats to enter and leave the lock. chamber although provision is made for unwatering in case of emergency. in case of a failure of city power operation of the lock would continue. be drawn off from time to time and deposited down the stream as required. so that such saline water can be drawn off in this manner. is in operation. This reduction will not only exist above the lock but also . below it. Th1is will be a great aid to navigation. will also be advantageous for the mooring, handling and docking of vessels. instead of the present 4 or 5 months in the year. out of much of the land already salted. freshwater lake for the mooring of vessels. ,:Commission of Dade County has a mandate to provide water control. The most important single source of salt water intrusion is the Miami Canal. as nearly as possible at an elevation of 2. above mean sea level. S locks is many times the lift required for our proposed structure. intrusion, from which municipal supplies.are pumped. , ,, :, ,r ..... ..
the ground surface to prevent subsidence by oxidation or burning. supplies for people and cities in and bordering the Everglades. Legislature wherein recommended water control practices could be . program must be carried out without further delay. the proposed N. W. 20th Street location. industrial surveys, and investigations of navigation costs and problems.